Hello, dear friends, after experiencing a real life Series of Unfortunate Events I have been on a bit of a hiatus, but glad to be back in the library saddle to share the best of what is on my shelf from the past year as you are deciding what to add to yours. As always, I am making recommendations with read-aloud, classroom use, potential for discussion, visual/art education and/or story time mileage at the forefront. This has been a strong year for appealing retellings, stories about friendship and a even a trend of children's books that may or may not be for children! I have nonfiction faves to be featured soon in another post, but for now, please peruse 2017's top picture book picks! 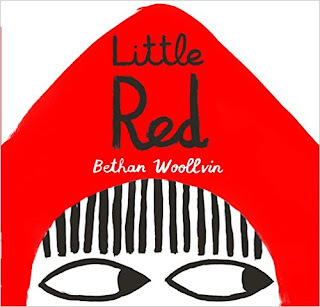 No little girls getting rescued in this version of Red Riding Hood sans woodcutter. Full of violence, calamity and surprise, my reaction upon reading was "finally, someone know what kids really like." Don't be fooled by the simplicity of the illustrations, their broad strokes and limited palette; every line is bold, intentional, effective, ingenious. I imagine would make the great Molly Bang of Picture This fame very proud, as really, this artist did everything right. If I ran the Caldecott, this would be my pick. "Your fur is freezing," said Mona when Lucy came inside. "Your nose is dripping," said Millie. "Your teeth are cheddar-ing!" said Marcello. Your teeth are cheddar-ing? Says one mouse to another? Seriously. Story time mike drop. Another Caldecott contender! 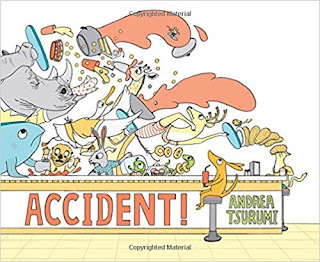 When an armadillo spills juice on furniture and incites reckless fleeing from the scene, fracas ensues, culminating at the library...where else! This slapstick story manages some visual acrobatics that when you're done laughing, gasping and pointing at all the worst-case cause-and-effect scenarios that can possibly be imagined, the cognizant reader would have to marvel at the kind of planning it would take to visually execute these spreads. It's mind boggling. While it might require some ingenuity to share this effectively in a large group setting because of the detail, it's worth it because of the big idea behind this book: that even when something is an accident, you need to say sorry (a similar idea receiving very different but complimentary treatment in Trudy Ludwig's Sorry). Descendants of Rube Goldberg and kids with a penchant for graphic novels (i.e. pretty much all kids) will find this offering suits them to a T. Don't we all love a picture book we can look at a hundred times and always find something new? Teacher alert! Teacher alert! Woot! Woot! Woot! Many people know Schachner from her wildly popular Skippyjon Jones series, and I'm glad sister is making bank, but in my opinion those are far from her best books. 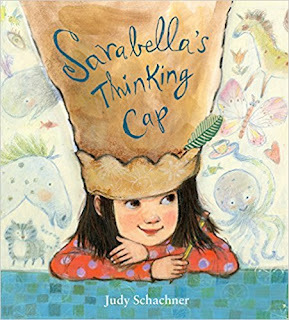 I would invite readers to explore her inventive and visually glorious Yo, Vikings!, The Grannyman and this latest offering about a daydreaming girl who figures out how to share what's inside her head via a beautiful hat (which of course now we all have to get brown paper bags and make our own). Fans of Patricia Polacco's Thank You, Mr. Falker will fall for this empathetic and inspiring story with a classroom setting...but mostly I like it because every page is like opening a secret drawer full of colorful jewels and treasures. Just what it should be like to look inside someone else's thinking cap. Marco the fox has so many questions, but when he poses them to his skulk, their reply is: "what does that have to do with chicken stew?" Clearly, when faced with an existential crisis, a little life experience is in order and a voyage on the high seas to a distant land with a crew of other adventurous (albeit inexperienced) animals fits the bill. I wavered somewhat about including this on the list; while a solid friendship story with a well-earned conclusion, the voice, while graceful, is a hair esoteric for my taste in terms of sharing with children. But the production quality of this book as an object is so over the top (feel the paper quality of the cover in your fingers! I'm not kidding! 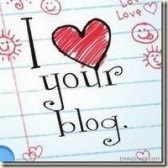 It's a thing!) 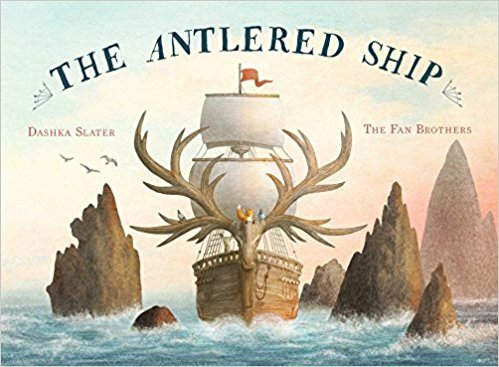 and the illustrations...well, the scene with the ship crashing on the waves in a storm...these dramatic double-page spreads, you can almost hear the waves lapping, antlers crashing, boom of cannons! I couldn't help thinking of what Nicola Bayley's pictures did to a generation of children's picture book lovers in The Tyger Voyage, how could a new generation be deprived of another launch on to the sea of lifelong reading? 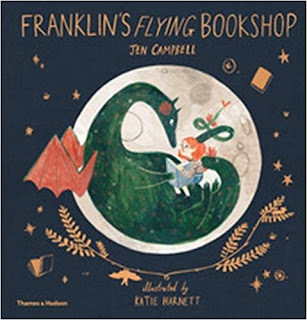 Completely charming story about a gentle, book-loving dragon who scares the heck out of townspeople in his search to find a literary soulmate. When he does, the magic really begins as they invent a storefront on the dragon's back in hopes of sharing their favorite titles...and a lesson in the limits of xenophobia. Folksy illustrations and varied layout from page to page keep an already strong read-aloud visually engaging as well. Besides being a beautiful book with a clear middle-beginning and end and problem to solve, I love it as a launchpad for envisioning inventive spaces for making our dreams come true, and talking about the role of bookstores and libraries in our communities. Casey likes his sister Jessie's shimmery skirt, glittery nail polish and sparkly bracelet, but his sister is chagrined when these propensities elicit responses from parents like "I don't have a problem with that." Can't they see how embarrassing and socially precarious this could be? It's not until Casey is under his sister's wing while he receives the brunt of intolerance that she has to make a serious choice about how to respond. I confess I approached this book with caution, I am not a big fan of prescribing literature for children (don't let my prescription pad fool you). 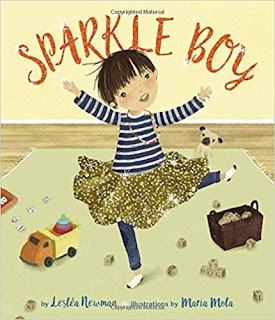 The real value of this sensitive but straightforward book is that it is not actually for the sparkle boys in the world but the people around the sparkle boys. This story is age-appropriate, not about decisions of sexual identity per se but whether we can choose to be accepting of people as they are authentically, and question the legitimacy and arbitrariness of our own social parameters. Holy smokes. 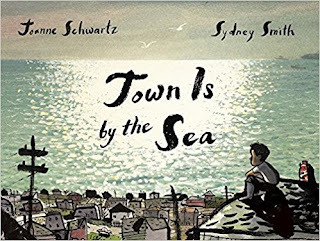 Excellent realistic fiction in picture book form like this should be cherished for classroom use. Sure to inspire very necessary classroom discussions of how we need to treat one another and what world we want to live in. Then, on to math worksheets. 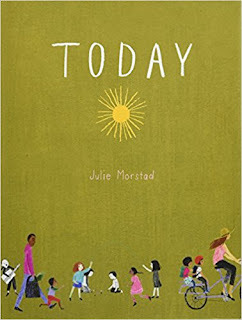 The cover is a bit minimalistic (read: drab) but picture book lovers know to trust, trust, trust Julie Morstad with your reading life and this gem is no exception. This book is a celebration of daily decisions: what to wear? What to eat? Where do we go? What flowers to pick? What book to read? So many choices, and Morstad creates quite an appetizing visual menu that will have young readers clamoring to decide. This book is a celebration that brought to mind some of the work of early picture book geniuses Gene Zion and Gyo Fujikawa in their invitational approach and the immediacy of experience that is so empowering for young readers. Specifically, I remember reading Jeffie's Party by Gene Zion when I was around six years old approximately, ohhh, six thousand times, just for the chance to revisit the choices of what costume to wear to the party. I don't know what even would have happened to me if I had been given this book as a child, with beautifully illustrated choices on every other page. I think my head would have exploded. Worth the risk. First of all, do we ever get sick of magnificent visual reinterpretations of classic fairy and folk tales? Answer: uh, NO. (see Jerry Pinkney's The Grasshopper & The Ants should you require further convincing.) But in the interest of full disclosure, I have to confess, I have the biggest raging art crush on Maggie Rudy, it's hard to put into words. I can't even. Her doll work on her blog, MouseHouses, has inspired me to work on a novel for the past two years just in the most remote-as-Siberia hope she might consider illustrating it. Honestly. I think she is magic. In this latest of her picture book offerings, I think she really has hit her stride and plays to her strengths. 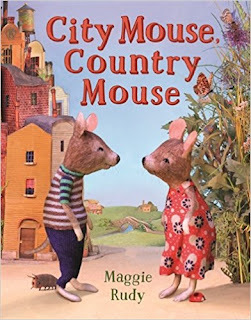 Each mouse in turn tries to share the virtues of their urban and rural environments, as the retelling goes. What sets this version apart, besides the inimitable photographed scenes of her mice characters casting a spell of suspended belief in all other realities, is that she has captured the romance of a deep friendship. This is real; children can relate to the peril of situational loss of someone to whom they are connected, whether changing classrooms or having to move. Readers can feel the palpable longing in the mice's separation, and the relief in their reunion and clever compromise. This happy ending suggests that where there's a will, there's a way, and if you're lucky, there might even be a strawberry patch. It's hard to find a good love story in children's literature that is not too mushy and even relatable. Score. I received this book and was awash with wishes. "PLEASE let it be as good as I hope! PLEASE let it be as good as I hope!" As a teacher in a tundra (Chicago), I have been waiting for, hoping-double-crossed-fingers for a good solid book about a snow-mover as Ethel Kessler's Stan the Hot Dog Man was just not cutting the mustard for my crew any more. 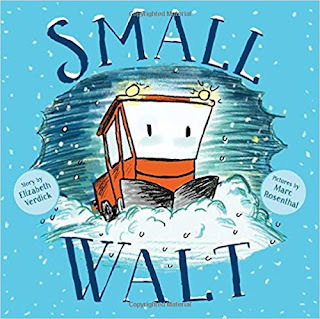 And here we go, a hybrid of Mike Mulligan and The Little Engine that Could and a spirit all its own as earnest Small Walt shows the bigger snowplows that he can clear a path with the best of 'em. Well written in a rhythmical way just right for a post-blizzard storytime. An artist leaves a couple of glomps of clay on a workspace, and when the artist steps away they come to life and reinvent themselves repeatedly with more and more hilarious results. 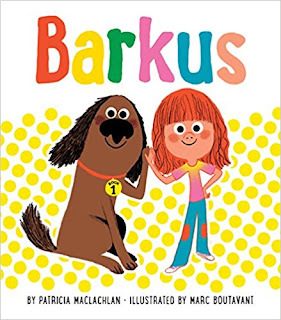 This book reads like a photographic comic book with tremendous kid-appeal, and taps into the way friends can encourage one another to become their best selves...and to laugh harder. 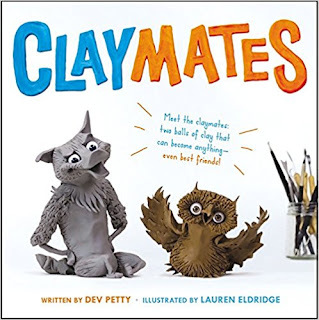 Of course, this read-aloud must be followed by clay on every desk for imaginative play, puppets shows and photo narratives. A creative and creativity-inspiring tour-de-force, and just. So. Much. Fun. This ain't your mama's Corduroy, no, there's a new anthropomorphic stuffed animal bad boy in town. This is more like No, David! on stuffed animal steroids...you can even see the homage if you look carefully on the cover, and another one hidden inside. I was concerned that the story might be too derivative of classics, but the very clever and original high-stakes device of having the reader coming home to police (!!!) and receiving the harrowing play-by-play report definitely upped the ante from page one, and the visual jokes are fresh, zany and will have story time audiences roaring. 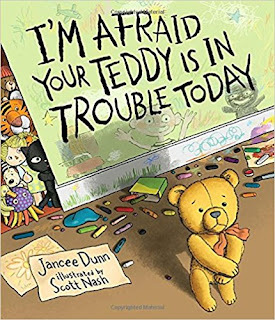 Starting from the teddy bear's acquisition of a cell phone to call other toys to invite them to a bed-jumping, dress-up playing, bath-taking, one-hundred balloon pancake party that unfolds with every turned page, how will this mischievous teddy possibly avoid being taken down to the station? Sure to be a favorite. 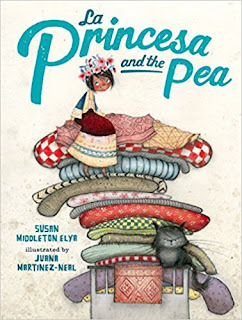 A rhyming retelling of the Princess and the Pea with Spanish language interjected throughout with strong context clues for all readers, and the textiles depicted in the book are "inspired by the weaving and embroidery of indigenous people of Peru" (from the illustrator's note). Fairy tale retellings that embrace diversity are always a boon in the classroom, but this little princesa is particularly fetching, and the theme of family is piled high. One of the great purposes of literature is to carry us away to a different time and place, and to allow us the chance to use our empathetic imaginations to live the lives of others. In this miracle of art, we are allowed to visit in the average day of a boy in a coal village in the 1950's. We can see the sea from his window, the lupines in the wind, and every few pages, on a wordless double-paged spread, we can see his father, a figure nearly crushed under the weight of black scribblings overhead, and a fate that may await the carefree boy when his time comes. No bells, no whistles, no jokes, just a family and a life and a chance to know it. Gosh, what a gorgeous book with more gravity than the average pick. Five read-aloud ready vignettes about a new family dog in a perfect petit package of gumdrop-colored illustrations. As I was reading, I thought, "how is the writing this tight?" Then I looked at the author, oh yes, mystery solved, this is the woman who penned the beloved, short and sweet Newbery-winner Sarah, Plain and Tall. 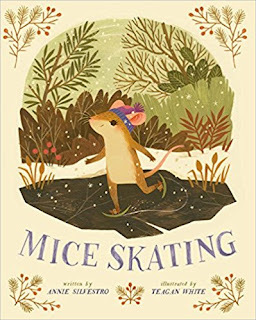 If you have an emergent reader who likes animal stories, this is the kind of book that makes a child realize s/he can read, and s/he love it. This is going to be somebody's favorite childhood book, so you might as well have it in your collection in case that child is yours. One of the big trends I noticed this year were books that appear to be children's books but they are really unbelievably beautiful illustrated books that children can happen to read. One of my favorite books this year, and maybe ever, is one of those: Pandora by Victoria Turnbull, clearly an allegory for a very adult situation. Then there's Along the River by Vanina Starkoff, A Cage Went in Search of a Bird by Cary Fagan, illustrated by Banafsheh Erfanian, A River by Marc Martin (apparently grown-ups like rivers and birds in their picture books), even books getting Caldecott buzz like Windows by Julia Denos and illustrated by E.B. Goodale, The Book of Mistakes by Corrina Luyken and Here We Are: Notes for Living on Planet Earth by Oliver Jeffers, for all their immense beauty, have a quietude and sometimes meandering feel to the storytelling that make me wonder who the intended audience really is. I'm not sure they have pacing or messages that are intended for children primarily. That doesn't mean children can't enjoy them and experience them in a way that resonates and can be revisited; along those lines, Trina Paulus' Hope for the Flowers was such a book from my own childhood, another example is Sara Varon's heartbreaking masterpiece Robot Dreams, and many of us know Antoine de Saint-Exupery's The Little Prince to be one book when we are young and another when we are older. 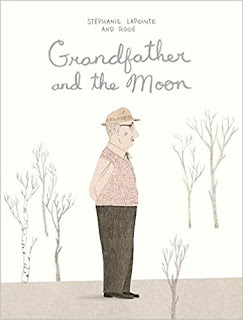 I hesitated to include Grandfather and the Moon to this list just because I wasn't sure it was a children's book but instead an illustrated book children can read. But then I remembered all of this, and I would be remiss in not including it because sometimes we just have to give children things that are beautiful and strange and if not for us now, for us someday. This story, originally published in French in Canada a few years back and now in English translation, tells the story from a granddaughter's point of view of her grandfather and his decline after the loss of his wife. The narrative then takes a somewhat sudden turn when the narrator wins a contest in which she is permitted, as a civilian, to travel to the moon, and discovers the adventure is not all its cracked up to be. At the story's core is a truth about what it means to be there for someone else. The illustrations are muted and unassuming but expressive and consequential. The prose's unique and personal detail afford the reader a sense of intimacy, like a friend telling one what one knows about the world as best as one can, that is, really, why anyone should write at all. Not for the hordes, but for the one. Bravely, the writer and illustrator in this book are here for us, one by one, in this unusual surprise. 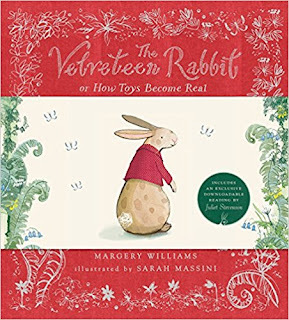 Lastly, goodness knows this classic story of a toy rabbit made real is not a new book, originally published in 1922, but its reissue this year with the original text in this lovely oversized format perfect for read-aloud and larger group sharing is worth a mention. 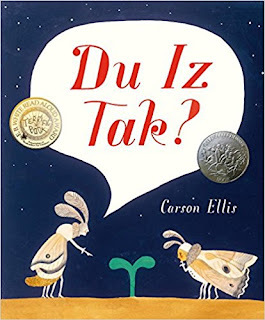 Additionally, if we're talking oldies but goodies, I also want to remind folks to add my favorite book of last year to their shelves if it's not there already: Du Iz Tak? by Carson Ellis (Candlewick) is the exciting adventure of some whimsical garden creatures and the strange thing growing there, told in what initially seems like gobbledegook but within pages the reader realizes it is a new language. Just as the fluency begins to blossom, so does the surprise in the garden. The surprise that blossomed this year was realizing what a favorite it has become with ELL and ESL students in my school library, some checking it out repeatedly. This big, beautiful book levels a playing field of accessibility to reading and experiencing illustrated literature, and is worth sharing with every child you know. What are your favorite picture books of this year? Have you had any experiences sharing books that appeared on this list? Please share in the comments! Links provided for information. Please support your local independent bookseller.